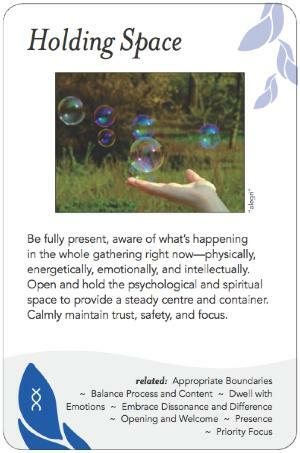 Be fully present, aware of what's happening in the whole gathering right now--physically, energetically, emotionally, and intellectually. Open and hold the psychological and spiritual space to provide a steady centre and container. Calmly maintain trust, safety, and focus. The "container" is the psychological or spiritual space within which a group works. The facilitator's role is to create (through invitation) and to help the group co-create, that psychological space, and then to hold it open, to allow knowledge, learning, understanding, energy, ideas, perspectives, tensions and dissonances, and appreciation to flow and be contained in that space, to enable the group to process all this 'content' and achieve its purpose and intention. This requires the facilitator to be totally present, attentive to what is said and not said, happening and not happening, dancing energetically between purpose and agenda, and intervening when necessary to keep the space open (not close ideas, possibilities and understanding off prematurely), to keep it safe (so those present are not afraid to contribute), to set appropriate boundaries, to maintain its flow and energy, and ultimately to help the group narrow it (through the "groan zone") to converge on a consensus and appreciation of what makes sense to the group. This entails stepping in when someone goes off topic, makes a hurtful or sarcastic comment, or when there are multiple, unintentional side conversations, or when people are interrupting or dominating, or when outside agenda or distractions intervene. It requires encouraging openness (honesty, openness to receive, openness to solutions and new ideas, openness to possibilities, encouraging people to share. With the facilitator holding the space, the participants are freer to participate, to immerse themselves in the doing of it. It is a process of deep listening, enablement, active reflection, supporting all sides, stewarding forward, and supporting all sides. It requires setting clear intentions, setting expectations, establishing norms and ground rules, and providing clear instructions. It may entail ritual, and always requires trust. There may be occasions where we need to make space at the boundary for people to be half-in and half-out. Vulnerability can be powerful in its ability to create a safe space, and facilitators as well as other leaders in a group are well positioned to role model such behaviour. When one person is honest, it can give permission for everyone else to be honest. Spaces are safer and more likely to grow in a healthy and creative way when a culture of not knowing all the answers exists. This culture cultivates a learning community where curiosity is valued and it is important to ask questions. Sharing circles where everyone tells candid stories, creating safe ground rules, confidentiality rules, reassurances that I value you being honest, and enabling anonymous feedback can all be effective for getting facts and perspectives aired and holding the space safe for truth-telling. The container and space may be disrupted by lack of focus, disorientation, lack of a feeling of safety, distractions, or lack of trust. People tend to drop out or not be engaged fully when the container is not held well. Unreasonable time constraints (or poor time management) can result in an interruption of the flow and close the container/space prematurely. Be aware of cultural differences around what it means to be safe; you can't control what safe is for other people. Safe is a relative and culture-bound term and the objective is to create and hold a space that is as safe as possible. If you make a commitment for information to not leave the room, keep it. Beware of expecting people to tell the truth when there are dangers to doing it; they may be risking their job. What creates a leak in the container, and what catches and repairs that leak? What are the design criteria for creating a container in different situations? What's always involved, and what are the variables for different intents? What needs to happen before the event to create the container, and what is the follow-up after the event that keeps the container intact if that is the desire? Creating a container may look different in every culture, so how do we establish a container when not in our root culture? and blog post "Space has presence"
Session notes from containers session at Leadership in a Self-Organizing World. As part of a book I am writing on Collective Presencing I have written a piece on Holding Space, and what I understand by it. You can read it online on the book's website. At the bottom is a pdf to download.